The controversial US ambassador to the United Nations, John Bolton, is to leave his post, the White House says. Mr Bolton looked unable to win the necessary Senate support for him to continue in the job, which he had obtained on a temporary basis. Critics have questioned factors including his abrasive style at the UN. Mr Bolton's move comes after US defence chief Donald Rumsfeld resigned following the Republican defeat in last month's mid-term elections. The incoming chairman of the Senate Foreign Relations Committee, Democratic Senator Joe Biden, said he saw "no point in considering Mr Bolton's nomination again". The White House said President George W Bush had "reluctantly" accepted Mr Bolton's move to step down at the end of the current Congress session in January. 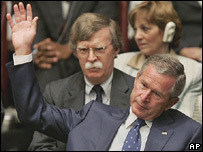 Mr Bush said he was "deeply disappointed that a handful" of senators were blocking Mr Bolton's confirmation. The departure would disrupt US diplomatic work at a sensitive time, the president said. The news comes days before a bipartisan panel is expected to suggest the US should begin talking to Iran and Syria, an initiative Mr Bolton has opposed. Mr Bolton took up the UN posting last year during a congressional holiday after his nomination stalled in the Senate. It was a procedural manoeuvre that avoided the need for him to be confirmed until the end of this year. That procedure cannot be repeated, and the new climate in Congress would make it all but impossible for him to win a majority of senators. A White House spokeswoman said Mr Bolton had "served his country with distinction". His achievements included the assembling of coalitions addressing North Korea's nuclear activity and Iran's uranium enrichment and reprocessing work, Mr Bush said. Democrats said the move could prove a turning point for the administration. Senator John Kerry said it was an opportunity for Mr Bush to nominate an ambassador "who enjoys the support necessary to unite our country and the world and who can put results ahead of ideology". Correspondents say Mr Bolton personified Washington's view of the UN as an institution that was viewed as being wasteful and ineffective at best - and inimical to America's wider global interests at worst. Mr Bolton's critics said a man who once declared there was "no such thing" as the UN was hardly a suitable choice to join the body. His nomination incensed many former US ambassadors - 102 of whom signed a letter urging senators to reject his nomination. But his admirers said he was a bright, hard-working realist - whose scepticism about the UN's role made him an ideal envoy, particularly when the organisation was in need of deep reform.